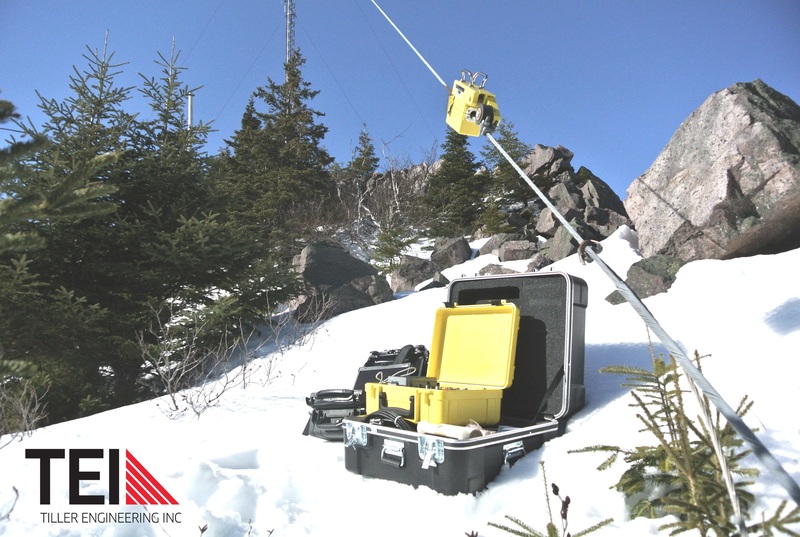 Innovation is one of the cornerstones of Tiller Engineering Inc.
TEI has invested in state of the art equipment and training to offer innovative guy wire and rope condition surveys of existing guy systems on guyed towers and other structures such as flare stacks, cranes and elevators. This equipment uses electromagnetic technology to survey and measure the through thickness of existing guy systems that are exhibiting surface corrosion. This type of inspection can also detect damaged or broken strands within the guy or wire rope. This service will help tower owners make a rational risk-based decision to replace or maintain existing wire ropes and guys based on solid and reliable technical information determined using this equipment. Electromagnetic instrumentation measures the loss of metallic area (LMA) and localized faults (LF) without taking the tower out of service. The test head is pulled to the upper guy attachment and lowered to the bottom attachment using ropes and a winch. A small amount of temporary rigging is required in the tower. Test results are recorded with the use of a computerized system and interpreted by the trained operator. Defects or loss of metal are noted and summarized in a field test report. A form engineered report follows that can be used in conjunction with a structural analysis to determine guy utilizations.